While the Chrysler Group is waiting until the upcoming Chicago Auto Show to debut the new Mopar 13, the Canadian Dodge website has let the car out of the bag with full details on the 2013 Dodge Dart Mopar 13 package. When the Chrysler Communications Facebook page debuted the interior teaser shot (click here for a look) of the Mopar 13, it seemed to be clear that this newest Mopar branded vehicle would be based on the 2013 Dodge Dart but the configuration page on the Dodge of Canada website pretty much confirms that fact. The Mopar 13 package is currently listed as a no-charge upgrade for the 2013 Dart Limited and surprisingly – it looks like the Mopar 13 Dart is available with either the 2.0L Tigershark 4-cylinder or the 1.4L turbocharged Fiat MultiAir engine also featured on the Fiat 500 Abarth. The Mopar 13 Dodge Dart package begins on the outside where Pitch Black is the only available color option. The Mopar 13 also includes a black crosshair grille with a black surround, black headlight bezels, black door handles, a black Mopar front spoiler, a black Mopar rear decklid lip spoiler, black Mopar splash guards, and gloss black 18” aluminum wheels wrapped in all season performance tires – black wall, of course. As was the case with the other Mopar vehicles, the Mopar 13 Dart wears a variety of blue trim on the outside including the brake calipers and a graphics package that extends across the hood, roof and decklid along with some chrome Mopar badging completing the exterior package. The Mopar 13 package also adds High Intensity Discharge (HID) Bi-Xenon headlights and the gorgeous “racetrack” taillight setup that comes on every new Dart. Inside, the Mopar 13 Dodge Dart package adds a black shift bezel with blue accent stitching, black chrome bezels around the HVAC controls and the infotainment controls, Mopar floormats, a chrome Mopar shift handle, Mopar stainless steel door sills, gloss black trim throughout the cabin, a Mopar wireless charging pad and the 8.4” touchscreen that controls the infotainment system along with the slick 7” TFT gauge display. Finally, the Mopar 13 package adds a Mopar performance exhaust system with chrome tips that will hopefully allow the engine announce itself a bit while also flowing better – thus making a little more power. In the fine print for the Mopar 13 package, there is mention of a sport suspension package that “may include” higher rate springs, unique shock absorbers, special bushings and stiffer stabilizing bars. Unfortunately, with the vague nature of the description and the fact that there is no mention of a sport suspension in the Mopar 13 package, this feature may not be included. We should all keep in mind a few things about this initial information on the Mopar 13 Dodge Dart. First of all, this information applies to the Canadian market and while we can guess that American version will be identical – there is no guarantee of that. Features of the US-sold Mopar 13 could differ from what is displayed on the Canadian Dodge website and considering that it isnt unheard of for there to be incorrect information on a build page, those hoping to grab up a new Mopar 13 should wait for full official details before making any deposits. We can expect that the Mopar 13 will be sold in limited numbers which make its puzzling that the performance minded compact sedan could be offered with the entry level 2.0L engine. I would guess that American Mopar 13 sedans will all come fitted with the 1.4L turbo motor with the buyer’s choice of either a proper manual transmission or the new dual dry clutch automatic but who knows – Chrysler could surprise us all and offer the Mopar 13 with the base engine…although that is hardly the Mopar way. The 2013 Chicago Auto Show will bring about the debut of the Mopar 13 Dodge Dart so we can expect full information on this special edition sport compact sedan in about 10 days or so. 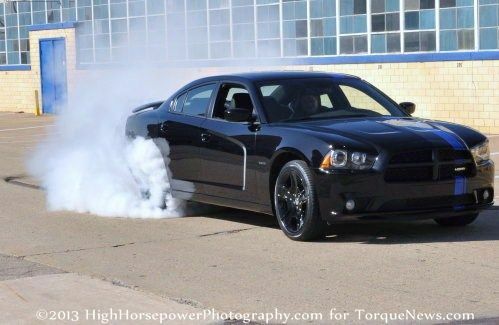 Shown above is the Mopar 11 Dodge Charger doing a big nasty burnout. While the Dart based Mopar 13 probably wont be able to do this (it is, after all, front wheel drive), the Mopar 11 should give us a good indication of what to expect in terms of styling of the Mopar Dart.